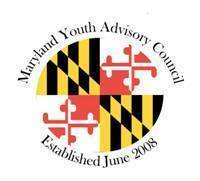 The Maryland Youth Advisory Council was established through the state legislature (Chapter 559, Acts of 2008 and Chapter 69, Acts of 2009), in order to ensure that Maryland youth are given the opportunity to provide feedback and recommendations regarding public policies and programs that affect their future and to take a leadership role in creating meaningful change. Council members must be 14-22 years of age (as of September 1, 2015 for those applying for the 2015-2016 cycle). Members must serve a one year term (September 1 until August 30) and cannot serve more than two consecutive terms. Hold at least one public meeting on issues of importance to youth (topics can include: education, a safe learning environment, employment opportunities, increasing youth participation in government, health care access and quality of care, substance abuse and underage drinking, emotional and physical well-being, the environment, poverty, homelessness, youth access to services, suicide prevention, and educational accessibility issues for students with disabilities). For more information visit http://goc.maryland.gov/myac/.